Posted in the category: Blog, . If you had told me over 12 months ago that my kinder group was taking action to support Asylum Seekers in Australia, I would have laughed and said “how?”. Well, that is exactly what the Kangaroo children of Annie Dennis Children’s Centre did last year. It was a variety of experiences that brought together an understanding and a form of action made by my group to make a difference in other people’s lives. It all started off when a young boy in my group, let’s call him Joe, said “worms are yuck!”. 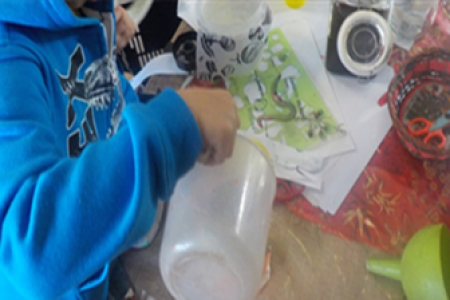 We had been making worm juice to fertilise our garden. My teacher mind had told me it was a great experience for children to connect with the natural world and specifically understand the important role of worms in growing plants. I thought I had persuaded my group of children that worms were ace and we had moved away from the rotten label that worms can get! I went on to explain to Joe how we had been using the worm juice to fertilise our garden and I was thankful for worms! I knew that we had to do something else to convince Joe that worms are awesome. This led us to making more worm juice and distributing it among the other rooms in our service. It was great to see the children feel important as they handed each room a bottle of worm juice and explained to the other educators how to use it. Our attitude towards worm juice was beginning to change. We continued to make our worm juice. So much so that we were overflowing with the stuff. I began to wonder if perhaps we could sell it. Selling the worm juice would give the group an opportunity to start their own business, creating a sense of importance as well as support their mathematical thinking in counting the money! I put forward the idea to the group and they were more than enthusiastic. We began making signs for our stall and again, making more worm juice. I remember our first sale clearly. One of the children noticed another educator slot their gold coin donation into our bucket as Wilma shouted “we sold one!” This grabbed everyone’s attention as we excitedly ran to the bucket to count the money. This was just the beginning. We sold enough worm juice to fund our own excursion to a local café to have a babycino each to celebrate. It was an exciting afternoon at our local café as we rejoiced in our worm making business. But then we kept on selling more worm juice. People could not get enough of the stuff. I began thinking we couldn’t possibly expect the sales of the fertiliser to fund our trips to the café. We needed something more meaningful than that. We had also been exploring our cultural backgrounds. We had been learning about how Aboriginal people are the first Australians and that we have all come from somewhere else in the world either by boat or plane. I really wanted to emphasise by boat due to the negative term of the “boat people” in our society. I myself came by boat a few generations ago. I made a post in a teacher Facebook group seeking an organisation that may benefit from our earnings. Anthony Morris replied that he had led a similar experience and donated the money to the Asylum Seeker Resource Centre (ASRC). I felt instantly in my heart that this was what we needed to do. First, we needed to discuss with the group how some people come to Australia because it isn’t safe in their home countries and they need support. After that discussion, the group was enthusiastic to give their hard-earned savings to the ASRC. We had many conversations about making a difference. It had such an impact on some children that they also donated their pocket money to the cause. The ASRC was very supportive and appreciative of our efforts. They have a program where a spokesperson visits schools to discuss the issues that face asylum seekers. We were lucky to have Geraldine from ASRC come out and visit and thank us. Geraldine left us saying; “It really has to start here in kindergarten”. Research indicates that when children are exposed to discrimination, stereotypes and bias, they have a harmful effect, impacting children’s emotional wellbeing (Glover, 2016). We also know that children are capable of identifying stereotypes and are able to take action when supported and provided with these opportunities. Children in Australia are growing up in a diverse society where the media is known for portraying negative images of refugees and asylum seekers. At Annie Dennis Children’s Centre, we took the opportunity to bring together two strands of learning that the children were engaged with – exploring our cultural backgrounds and starting a worm juice business – that enabled us to directly challenge these negative images of refugees and asylum seekers, and to support a worthy cause. Glover, A. (2016). Children and bias. In R. R. Scarlet (Ed. ), The anti-bias approach in early childhood (3rd ed., pp. 3-16). Erskineville: MultiVerse Publishing.